According to popular legends, a great fire ravaged Rome for consecutive six days in 54 A.D and it ruined around 70 percent of the city and left half its population homeless. According to unconfirmed sources, Rome’s emperor Nero at that time was fiddling. Not only did Nero play music while his people suffered, but he was an ineffectual leader in a time of crisis. Our situation seems to be identical to theirs (Romans) as our leaders also remain occupied with unimportant matters and neglect priorities in a time of necessity. And this happens because we (different state organs to be particular) never learn from our mistakes. Almost 10 years ago an industrial fire claimed at least 124 lives in the city’s Old Dhaka area (Nimtoli) in June 2010. At that time a public outcry sparked, demanding the relocation of chemical warehouses and stores packed with combustible materials from Old Dhaka area. After that incident people expected that they would not have to witness this type of incident again as everyone thought all the stake-holders will take a lesson from that occurrence. The government had also promised to take proper steps regarding the safety of the old Dhaka’s residents. But unfortunately nothing happened and the only thing that happened is the repetition of similar kind of accident. Interestingly while the surrounding areas of Chawkbazar were still heavy with burning smell our politicians were passing derogatory comments to each other and playing blame game to clear oneself of the due responsibility. It is mentionable that in both of the cases chemical warehouses, situated in residential buildings, emerged as the culprit irrespective of the primary source of the fire. The chemical erupted like a volcano and spread like wildfire, engulfing the entire building and the neighbourhood in a flash. The recent tragedy of Chawkbazar clearly suggests that nothing has changed and the situation of old Dhaka still remains the same as it was in 2010. Neither the concerned authorities nor the responsible persons did anything to change the fate of people of this old part of the capital. There are some reasons behind the repetition of such incidents. A primary reason is the greediness of the people. Factors such as neo-liberal economic growth, profit maximisation and valorisation of immaterial qualities are driving lifestyle in mega cities like Dhaka. Old Dhaka is related to the rest of the city through a series of exploitative relationships of profit. Here the greedy businessmen always think about making more profit and as the area Old Dhaka is cheaper than any other locality of this mega city and it is easy to carry products to the retailers, they opt for this area for storing their products and for establishing factories. On the other hand, the house-owners rent their house for warehouse and factories as they get more rental fee and a handsome amount of security money, which is much more than residential rent. As a result, many residential and commercial buildings are being used as chemical factories and warehouses in that area. ‘Bangladesh Environment Protection Act 1995’ does not permit anyone to run chemical factory or warehouse in residential areas, but an estimate by Bangladesh Poribesh Andolan says, over 25000 chemical factories and warehouses have been established, showing thump to the Act and blurring the difference between residential and industrial spaces, in Old Dhaka, of which around 15,000 are in residential buildings, although the city corporation has issued licence for only 2,500. Another reason is that though fire tragedies are frequent in Bangladesh and often cause high casualties, no one has ever been punished for their role in any fire incidents. According to fire service data, between 2004 and 2018, at least 1,970 people have been killed in more than 2 lakh fire incidents across the country. 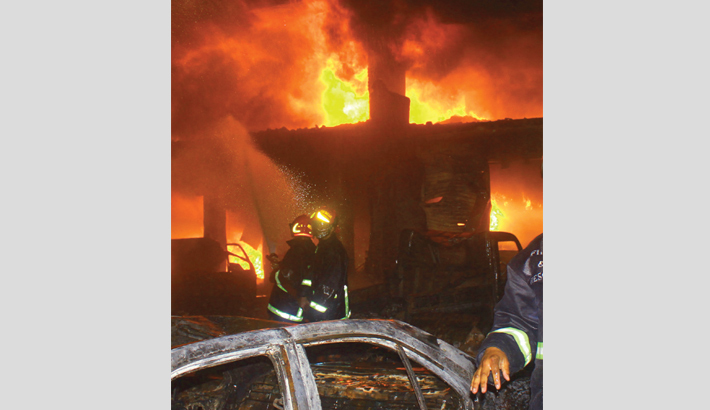 After almost every fire incident, especially the major ones, police filed cases or general diaries. In some cases, survivors have also lodged complaints. But the cases saw little progress and the victims never got justice. For instance - after the Nimtoli inferno, where the fire originated from a stove in a building, which housed a combustible chemical depot on its ground floor, a relative of a victim filed a case against the building owner, but the investigation has not moved an inch in the last nine years. No one has been arrested either. While it is the condition of a major blaze occurrence, speaking about other incidents is simply a waste of time. The third one, and probably the most significant one, is the negligence and unwillingness of the concerned authorities to control the hotchpotch situation. The concerned authorities like Ministry of Industry, DSCC and others have utterly failed in this regard. After the Nimtoli incident, a five-member probe body placed a 17-point recommendation, including immediate shifting of all warehouses and shops from the densely populated Old Dhaka. The probe body also recommended to ban storage and sale of all flammable substances in residential area, form a national taskforce to face any disaster, enforce the Fire Prevention and Extinguishing Rules 2003 and Bangladesh National Building Code strictly for building structures and take legal action against unauthorized warehouses. The body also recommended for creating public awareness against storage and sale of flammable substances in the residential areas. But still now no visible initiative has been taken to implement any single recommendation. Moreover the government’s initiative to relocate the factories in industrial zones in Keraniganj, on the outskirts of the capital, is yet to see light due to the dilly-dallying attitude of the authorities concerned. The government had selected 50 acres of land to shift the chemical factories, but the land development work is yet to be started. Meanwhile there is allegation that the businessmen and factory owners of old Dhaka are not willing to shift to the new places and the Ministry of Industry and other authorities have also failed to make them bound to follow the order. This sort of activities indirectly goes in support of the greedy and scrupulous businessmen. The fact is that present political situation of our country allows little scope of accountability. That’s why out politicians and the state organs do whatever they like- they even do not feel the urge to perform their duties honestly and timely. As a result incidents like Nimtoli tragedy got repeated and nobody is even directly held responsible for that offence.